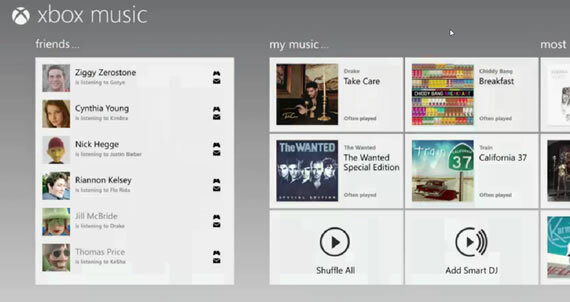 Microsoft has announced Xbox music service, the successor it’s Zune service. Microsoft is moving away from Zune to Xbox and the music service launched today is the rumored Woodstock service. The Xbox music service will be available on Xbox 360, Windows 8 devices and Windows Phone. Xbox Music will feature 30 million tracks for users and Microsoft will keep the Zune Smart DJ feature in Xbox Music according to The Verge, but other than that the Zune brand may be dead. It is nit clear when the service will be live and available to users. Metro interface is visible in the service and some social elements will be probably make it to the service, one is already visible as friends list according to Verge. It is also possible that the music service will be available on other devices as well including iOS and Android apart from Xbox, Windows 8 devices and Windows phones, but it only a speculation as of now.